We are pleased that you want to order rhabarberleder! 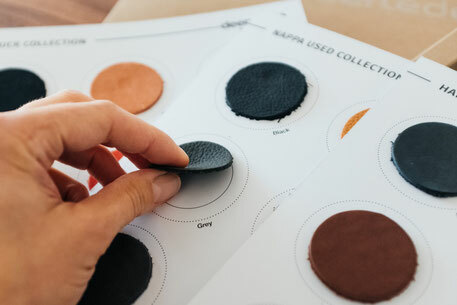 The minimum order quantity for our rhabarberleder (rhubarb leather) is one skin. The default size of an entire skin varies between 5 sqm and 6 sqm. An overview about the current portfolio is here. Please use the contact form below and enter for your favorite hides the desired color, thickness and surface (nappa, nubuck, suede, used). We will contact you as soon as possible for an individual offer. Do you want more information: we also advance material cards and samples. Our material cards are high quality and since we get a lot inquiries we would like to charge an extra amount of 10,- EUR (plus 19% sales tax) for it. For a subsequent order we will be happy to donate this amount to the organization "Save the Children". Due to environment-related reasons, please ask only if there is a serious interest.